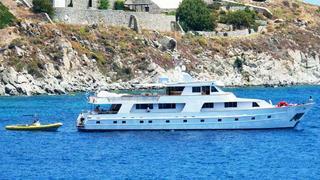 Nikos Odysseas Papdakis tells me that he's now listed the 33.32m motor yacht Ritaki for sale. Built by Turkey's Karadeniz yard in 1997, she was completely refurbished in 2006 with a fresh, minimalist interior in pastel fabrics and white oak panelling. The lower deck has impressive ceiling heights and accommodates 12 guests in six staterooms. Twin 450hp Caterpillar engines give her a cruising speed of 14.5 knots. Ritaki is asking €1.35 million.